Let's get you ready to start the nutrition plan! This week is about making sure you have all the tools and food you need to succeed. There is a lot of information to process so I'll do my best to break it up bit by bit each week. In the next day or two, a prescription of your calories and macronutrients (macros) for each week of the diet will be added to your GTS eTraining Log. Note that your coaching staff may only expose a few weeks at a time. If you don't already have access to your training log, let your coaching staff know! Take a look and let us know if you have any questions or concerns and we can make adjustments over the coming weeks. DO NOT worry about being perfect right from the start, this may be a process. Each week we'll try to refine your measurements, meal prep, habits, and food choices. Each day and meal do your best, enjoy the journey, and let's try to come up with solutions to any roadblocks you run into. 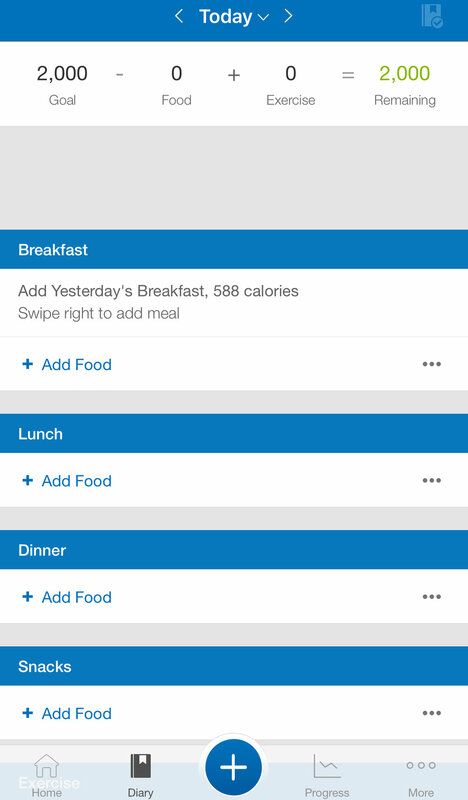 Download a calorie tracker app on your phone, we generally recommend MyFitnessPal (the free version is perfect). This is where you'll be logging your food, body weight and adding progress pictures. Weigh yourself 3 days per week, first thing in the morning, preferably around the same time. Get started logging your weight and progress photo right away. We'll also have you submit a weekly check-in, which we'll get into next week. 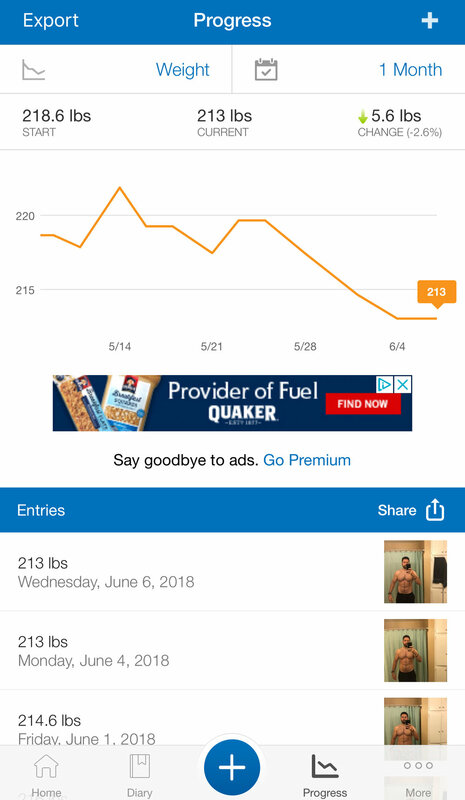 Prior to logging your weight, take a progress picture (bathroom mirror selfie from front or side). When adding your body weight to MyFitnessPal, add the photo to the progress picture section. I have found taking a picture on your phone first (vs. using the in-app photo feature) will capture a better quality that's easier to zoom in on in the future. Alternate taking pictures from the front and side so you have options to compare in the future. DO NOT weigh yourself several times per day. Try to focus on tracking averages over time. Fat loss or weight gain is not always linear and you'll drive yourself insane trying to understand day to day and hour to hour fluctuations. Again, focus on trends over time! Some of you might hate the idea of taking a picture now, but I assure you, you'll be very thankful later when you have something visual to compare your progress to. You are NOT required to submit a progress picture each week. You're more than welcome to share your progress, but you don't have to share anything you don't want to. Digital scale to track your body weight. Digital food scale to measure the quantities of food. You can estimate sizes, but most people (myself included) are very off in their estimations. Pots, pans and cooking utensils. The guiding principles of this program are to eat food that meet your calorie and macro goals. I'm not going to put any limitations on what you can or can't eat, it just should fall within your daily calorie budget. That said, I recommend building in a base set of calories each day that include several servings of protein and vegetables. If your goal is fat loss, proteins and vegetables will give you much more bang for your "caloric buck". You will be able to eat a larger volume of food, feel full longer and have more consistent energy. We'll dive more into meal prep, recipes, etc in the future. First few weeks we are going to trim your diet down to bare bones and start with the essentials. Each week we'll be adding a little more calories into your diet. We'll play around with what to add but typically, you'll want to add some starchier carbs back in. To get you started, we have included a variety of staple items you'll want to add to your shopping cart each week. These are just suggestions to get you started. Instead of the extra calories from oil. Pick up a few sauces, soups, hummus, broth, salsa's, etc to add to your meals and enhance or change the flavor from day to day. Pick up several seasonings like salt, pepper, garlic, 21 season salute (TJ's), Everything but the bagel (TJ's), fennel seed, crushed red pepper, etc. I typically don’t recommend purchasing a lot of pure fat items as you'll tend to get a lot of trace fats from various protein rich foods. Fat calories will keep you satiated but are very calorically dense (9 calories per gram) so it’s easy to go overboard if you aren’t measuring and keeping track. Make sure to measure anything you add because these calories count and add up quick! Generally limit to 1-2 per day. General recommendation is to limit alcohol consumption. But, if you plan to drink, log it and count it toward your calories! Pickles - low calorie, and helps to curb hunger. Treats, and snacks are permissible, just know yourself and if you’re opening pandora’s box. I know there are many treats that are off limits for me because once I start I can’t stop… choose items you enjoy but won’t binge on. Use a cup or something measured to keep your snack in. Open bag situations are generally bad. Measure out what you plan to eat and stick to that! Remember go easy on yourself! Try not to stress about being perfect. This will be a journey, let's just aim for small victories and improvements each week. I'll be creating more content which I'll send out throughout the 12 weeks to keep things digestible. Have questions? Layout or content improvements? General comments? Catch a spelling mistake? Let us know and help us improve!